Kanellos Kanellopoulos flew 119 km from Crete to Santorini, Greece, on April 23, 1988, in the Daedalus 88, an aircraft powered by a bicycle-type drive mechanism (see Figure 7.43). His useful power output for the 234-min trip was about 350 W. Using the efficiency for cycling from Table 7.2, calculate the food energy in kilojoules he metabolized during the flight. This is College Physics Answers with Shaun Dychko. We're going to calculate the food energy input of Kanellopolus when he flew from Crete to Santorini, Greece by first noticing that the efficiency is the useful work output that he did, divided by the total energy that he consumed to do it. We'll rearrange this to solve for W in by multiplying both sides by W in and dividing both sides by efficiency. Then we get the work input is the work output divided by efficiency. Now, the work output we can calculate based on knowing the power output which we are given and also the time that we are also given. 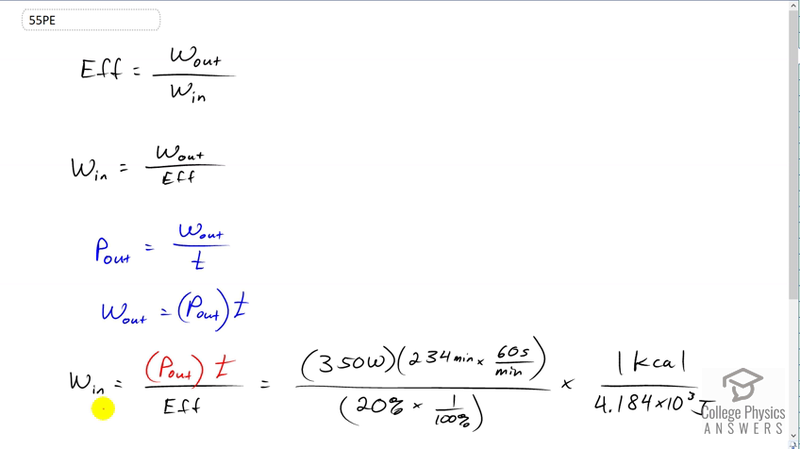 So power output is the work output divided by time and we'll solve for W out by multiplying both sides by t and so it's the power output multiplied by time which we then substitute in place of W out and we do that here. So the work input is 350 watts of power output times the 234 minutes converted into seconds and divide by the 20 percent efficiency for cycling that we looked up in the table 7.2. We divide that by 100 to turn the percent into a decimal and then multiply by one kilocalorie for every 4.184 times ten to the three joules. We end up with 5870 kilocalories consumed during the flight.